↑ Boram, Kim (9 February 2018). "(Olympics) S. Korean speed skater Mo Tae-bum takes Olympic Oath". Yonhap News Agency. english.yonhapnews.co.kr. अभिगमन तिथि 9 February 2018. ↑ "Korean figure skater Kim Yuna lights Olympic cauldron". Reuters. uk.reuters.com. 9 February 2018. अभिगमन तिथि 9 February 2018. 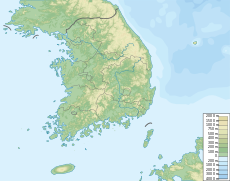 ↑ "Pyeongchang picked to host 2018 Winter Games". ESPN.com. 6 July 2011. अभिगमन तिथि 6 February 2018. ↑ Longman, Jeré; Sang-hun, Choe (6 July 2011). "2018 Winter Games to Be Held in Pyeongchang, South Korea". The New York Times (अंग्रेज़ी में). आइ॰एस॰एस॰एन॰ 0362-4331. अभिगमन तिथि 7 June 2017. ↑ Horwitz, Josh. "South Korea's $100 million Winter Olympics stadium will be used exactly four times". Quartz (अंग्रेज़ी में). अभिगमन तिथि 7 February 2018. ↑ "Winter Olympics: Big air, mixed curling among new 2018 events". BBC Sport. अभिगमन तिथि 21 June 2017. ↑ "6 New National Olympic Committees Welcomed to Winter Olympics for the First Time". pyeongchang2018.com. अभिगमन तिथि 4 फरवरी 2018. ↑ "Winter Olympics Full Schedule". बोंगो एक्स्क्लूसिव (अंग्रेज़ी में). 10 फरवरी 2018. अभिगमन तिथि 11 फरवरी 2018. ↑ "Quota allocation for Alpine skiing". www.data.fis-ski.com/. International Ski Federation (FIS). 8 August 2017. अभिगमन तिथि 8 August 2017. ↑ "2018 Winter Olympics". IIHF. iihf.com. अभिगमन तिथि 18 May 2015. ↑ "Quota allocation for Cross-country skiing". www.data.fis-ski.com/. International Ski Federation (FIS). 8 August 2017. अभिगमन तिथि 8 August 2017. ↑ "ISU Communication no. 2136". International Skating Union. अभिगमन तिथि 31 December 2017. ↑ "Quotas – Olympic Winter Games Pyeongchang 2018". IBSF.org. अभिगमन तिथि 15 January 2018. ↑ "Koreas to carry single flag at Olympics". 30 जनवरी 2018. अभिगमन तिथि 30 जनवरी 2018 – वाया www.bbc.co.uk. ↑ "Medal Standings". Pyeongchang 2018. अभिगमन तिथि 11 फरवरी 2018. ↑ "शांति संदेश के साथ हुआ विंटर ओलंपिक का समापन, ट्रंप की बेटी इवांका ने भी दर्ज कराई मौजूदगी". दैनिक जागरण. 26 फरवरी 2018. अभिगमन तिथि 26 फरवरी 2018. ↑ "IOC awards SBS broadcast rights for 2018, 2020, 2022 and 2024 Olympic Games". International Olympic Committee (अंग्रेज़ी में). 9 December 2016. अभिगमन तिथि 7 August 2017. ↑ "Russian state broadcasters commit to PyeongChang coverage" (अंग्रेज़ी में). अभिगमन तिथि 6 February 2018.